Add some extra support to your heavy gimbal with the Spider Gimbal Support Plate from DigitalFoto. Compatible with the DJI Ronin-S and Zhiyun Crane 2, this two-part mounting plate attaches around the gimbal handle and is secured with the two included screws. A sturdy eye bolt with an M5 thread attaches to the plate, and a separately available neck strap attaches to the eye bolt, providing needed support from your neck and shoulders, rather than leaving the burden on your arms. Rubber padding on the inside of the plate prevents damage to your gimbal handle, and helps to snugly secure the plate. 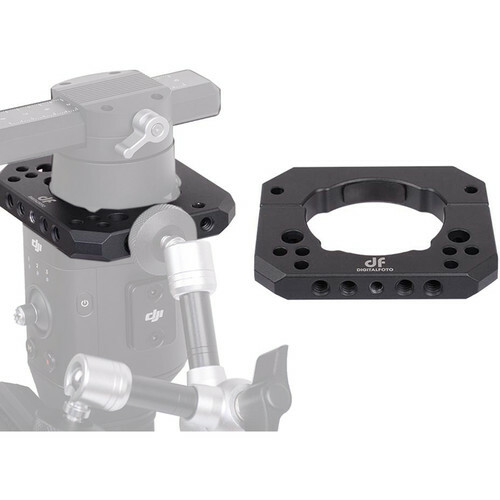 Multiple 1/4"-20 and 3/8"-16 threads around the plate allow you to mount accessories such as a light, extension arm, microphone, or monitor to the gimbal. An Allen wrench is included for tightening the screws. Box Dimensions (LxWxH) 3.75 x 3.0 x 1.0"